Over the last few years, Improv has evolved from being a spectator sport to being touted as a necessary survival skill for the 21st Century. I’ll bet you, or someone you know, has taken an Improv class and I wouldn’t be surprised if they loved the experience, maybe loved it to the point of becoming alt-evangelical. “How was it?” you ask them. “Great,” “fun,” “amazing, “I learned a lot about myself.” “Really?” you reply. “It sounds like Tony Robbins hosting a version of the TV show, Whose Line is It Anyway? Weren’t you afraid?” Yes, they were afraid, or at least uncomfortable, but they did it anyway. And therein lies the secret to the enthusiastic and widespread appearance of Improv outside of its performance function. Improv is fun ,it’s simple (if not easy) and it’s useful for everyone in some part of their life. Plus everyone (so far) survives the experience…and often returns for more. There is a lot going on in our lives, much of it unnerving. Trying to define the emotional state we, collectively, are in I came across Wayne Goulet’s concept of “liminal space.” Defined as “ a term that applies to those uncertain times in our lives when we stand in the threshold between the ‘old’ which may no longer work and the ‘new’ which is not yet clear,” it’s a perfect description of where we are on the evolutionary timeline. 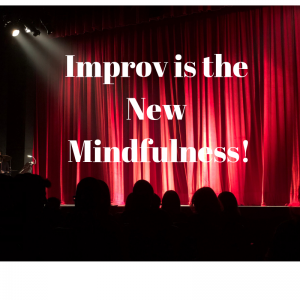 The practices and mindset that arise from Improv training are applicable to all of us. The change in purpose has shifted from Improv as a product, as in the theater, to Improv as a process. The product is not attainable by most of us; ALL of us can, however, apply the process. If Improv were a blood type it would be Type O, unique in its composition, useful for everyone. Just like Improv. Until recently, the word “Improv” was usually connected to “Theater,” so it had no relevance to most of us except as entertainment. We looked, we laughed, we left. The kind of Improv that is applicable to our daily lives and personal growth is known as Applied Improv. The premise is the skills that make Improv theater people successful are the same ones that make us all successful. Desired and achievable Improv skills include thinking on our feet, dealing with reality, focusing on what’s important, able to disagree without dissolving into conflict, having fun and being creative. It’s a growing field of practice around the world and popping up in all kinds of places and for all kinds of uses. 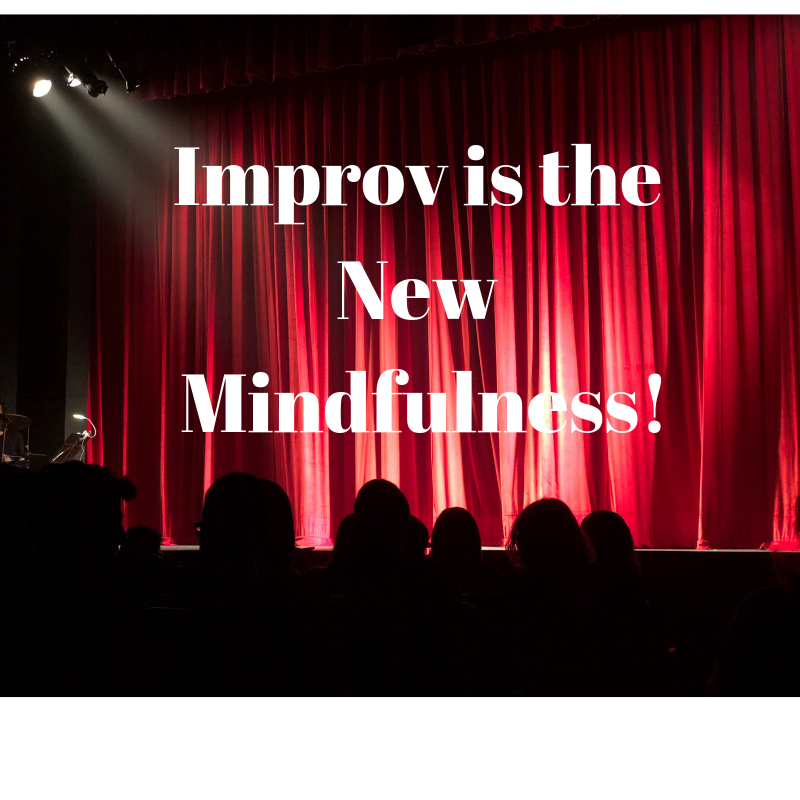 Like mindfulness, Applied Improv uses a skillset that is deceptively simple. Since it’s a skillset, it requires practice. Since its fun, it gets done. I’ll share more about Applied Improv in the next newsletter. In the meantime, here’s a game you can enjoy! Objective: To co-create a story that’s never been told before. Process: Each player can, at their turn, add only one word at a time. Time Needed: 2-4 minutesDirections: Make up a title of a story. Doesn’t matter what it is. Once the title has been chosen, decide which player will go first. Player 1 starts by saying any word. Player 2 then adds a word to what was given. Next, Player 1 adds a word to the words already mentioned. Focus Point: The word that you just heard in the context of the story up to that point. Hint: A simple way to start this game is for Player 1 to say, “Once.” Player 2 then says “upon.” Player 1 then says “a.” Player 2 says, “time.” This gets the game started and a rhythm established. Allowing the words, “period”, question mark”, exclamation point” to be used when a player deems it appropriate helps the story unfold. A player who injects these punctuation points still needs to contribute a word if it is their turn. Variations: Can be played with 3 to 6 players. Allow players to “popcorn” their answers rather than going in sequential order.